Product #45979 | SKU SLR-3517MFT | 0.0 (no ratings yet) Thanks for your rating! 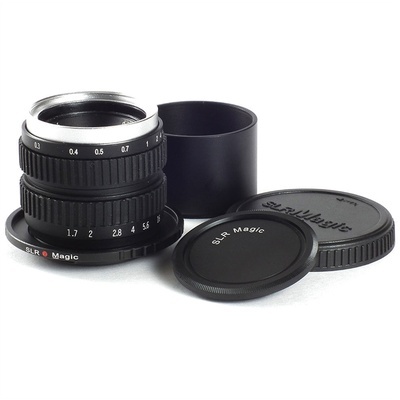 A compact lens designed for Micro Four Thirds cameras, this 35mm f/1.7 Lens from SLR Magic provides a 35mm-equivalent focal length of 74mm and is characterised by its fast f/1.7 maximum aperture. Its unique design produces a sharp central area of the image, which is surrounded by a gradual blurring effect towards the edges of the frame. Manual focus and aperture selection affords complete control over the look of imagery and its lightweight, sleek form is well-paired for use with mirrorless cameras. Compact prime lens provides a 35mm-equivalent focal length of 74mm when used on Micro Four Thirds mirrorless cameras. Fast f/1.7 maximum aperture benefits working in difficult lighting conditions as well as offers greater selective focus control. Additionally, an all-glass lens construction affords notable image sharpness towards the centre of the frame while allowing a unique blur to surround central subjects. Manual focus and manual aperture control. Slim form factor is complemented by a durable metal lens body.